Late Madan Kumar Bhandari is well known as the People’s Leader in the country and the Madan Bhandari Memorial College was established in the year 2001 AD with an aim to follow his academic vision. The college is a non-profit academic institution formed by the organization called Madan Bhandari Foundation. Madan Bhandari Memorial College delivers quality education to the students at an affordable price with an aim to transform itself into an academic excellence hub. The college has outstanding academic ambience to help the students learn independently, to achieve and develop significant learning skills and confidence that guarantee their treasured future goals and offers a numerous courses at graduate and undergraduate level. Madan Bhandari Memorial College is run by highly dedicated academicians, professionals and social workers. The college graduates strong presence in rewarding jobs and prominent positions proves that the institution has become a very first choice for the higher education which is a true fact that the graduates from MBM can compete anywhere and in any filed with the best talents. Madan Bhandari Memorial College offers wide financial support and scholarships to the deserving and eligible students. 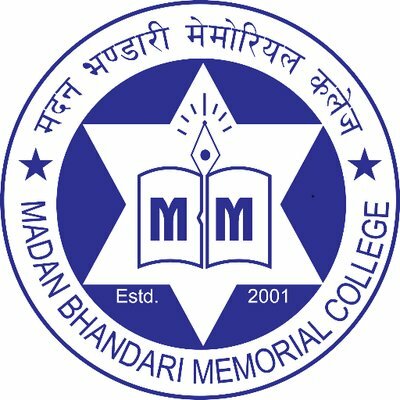 Madan Bhandari Memorial College offers intermediate level in Science, Management, Humanities and Education, Bachelors programs in BBS, BA, B.Ed, BSc. CSIT and Masters program in English, Journalism and Mass Communication, Sociology and Anthropology. The mission of Madan Bhandari Memorial College is to enhance the educational standards in the country and make the students more competitive for better opportunities by encouraging and inspiring them to acquire high knowledge. Why Madan Bhandari Memorial College ? Madan Bhandari Memorial College has its own popular radio station called Mero FM 93.5 Mhz. The college gives more priority to the practical knowledge with regular workshops and seminars in important issues. Madan Bhandari Memorial College has well managed science and computer labs with modern teaching facilities along with a library with numerous books of courses and references. The whole college premises are under CCTV surveillances. The classes are run by a highly professional teaching staffs in a friendly and peaceful environment. The college also offers personal and group counseling programs. Madan Bhandari Memorial College offers scholarship programs to the deserving and eligible students. The college is a non-profitable organization with an affordable fee structures. Madan Bhandari Memorial College also offers regular national and international tours. Bachelor of Arts offered by Madan Bhandari Memorial College deals with various aspects of humanities, social and cultural sciences, languages and music. Study this multidisciplinary course and pursue a promising career in any of the mentioned areas. Learn more details regarding the course and also about applying for our college. Bachelor of Business Studies is a course that is designed to familiarize the students with the fundamentals of business and prepare them for the specialization in many sectors such as economics, finance, management and many more. Know why to join BBS at Madan Bhandari Memorial College. Bachelor of Education is a course that prepares students to get qualifications to become a teacher. Study Bachelor of Education at Madan Bhandari Memorial College and equip yourself with the necessary skills and knowledges. Learn more about the course and applying procedures. Bachelor of Computer Science and Information Technology is the course designed to provide students with the knowledges and skills regarding science and computing. Here, we have outlined the details regarding the course and the reasons to study B.Sc. CSIT at Madan Bhandari Memorial College. The candidates interested to apply for the admission in Madan Bhandari Memorial College must have certain requirements. The applicants applying for science faculty in +2 must have scored at least 60% in SLC and the students with 50% of score in SLC can apply for other +2 level faculties. If the requirements are reached the candidates can apply for further admission process and have to take entrance and oral test held by the college. The candidates willing to apply for the Bachelors and Masters level at Madan Bhandari Memorial College must have all the required documents for the admission process. The candidates must submit all the required documents with completely filled application form for admission. The candidates then have to go through the entrance and oral tests and only the eligible students after both tests can get admission in the college.